It's always the right time of year to escape to this charming Manzanita cottage, a darling, dog-friendly retreat on the Northern Oregon Coast with a private hot tub, a lovely deck and backyard, and a wonderful neighborhood location within walking distance of downtown and the beach! 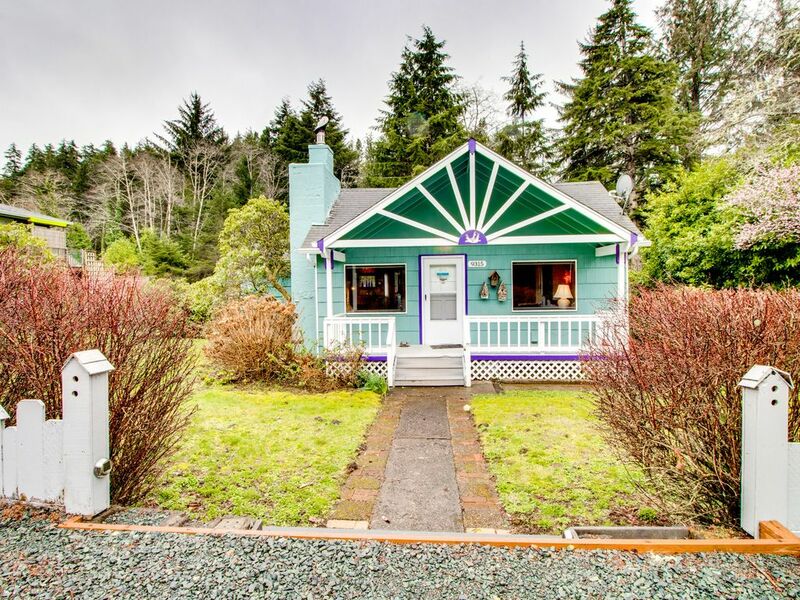 Cheerfully positioned behind a white picket fence, this single-level cottage sits half a mile up Nehalem Road from the beautiful beach at Neahkahnie-Manzanita State Park. You'll have two adult bikes and one child-size bike to ride downtown (one mile south), where you'll find such local favorites as Marzano's Pizza Pie and Bread and Ocean on Laneda Avenue. Back at the cottage, you can play tether ball, bocce, or a board game from the sizable collection. Parking Notes: There is space for one RV with two extra people for a total occupancy of eight guests. Water Access: The beach access point is 4/10 of a mile west on Nehalem Road. You can follow the same route, then walk another 6/10 of a mile down Ocean Road along the beach to get to town. Our family really enjoyed the stay at this little house near the ocean. The hot tub was perfect, clean and in a covered area. The kitchen is large and well-stocked which was perfect for our family of cooks. The phonograph was charming and our mother really enjoyed the old records. Thank you!! The Sea Slug was good for a weekend getaway! It had a well-stocked kitchen and the bed was comfy. It could have been cleaner...there were noticeable cobwebs in the front room, and there was a little detritus in the tub from the previous guest. It also got a little chilly at night out in the main area, though the bedroom has its own heater so it was warm. This cottage is in a great location, less than a mile walk to the ocean. It was clean and homey, linens were stocked well and the hot tub was very nice to come back to after a day at the beach! We would stay here again! Charming but just a little dated inside. Location was awesome. Loved the quiet yet peaceful sounds of all the birds. The house itself is charming and we loved the record player!! The house is very clean and taken care of. Couch and bed were super comfy. The hot tub was great- and it was so nice that it was covered since it was storming the first night we got there but were still able to use it. We were surprised to have WiFi access when the description said there wouldn’t be so bonus!